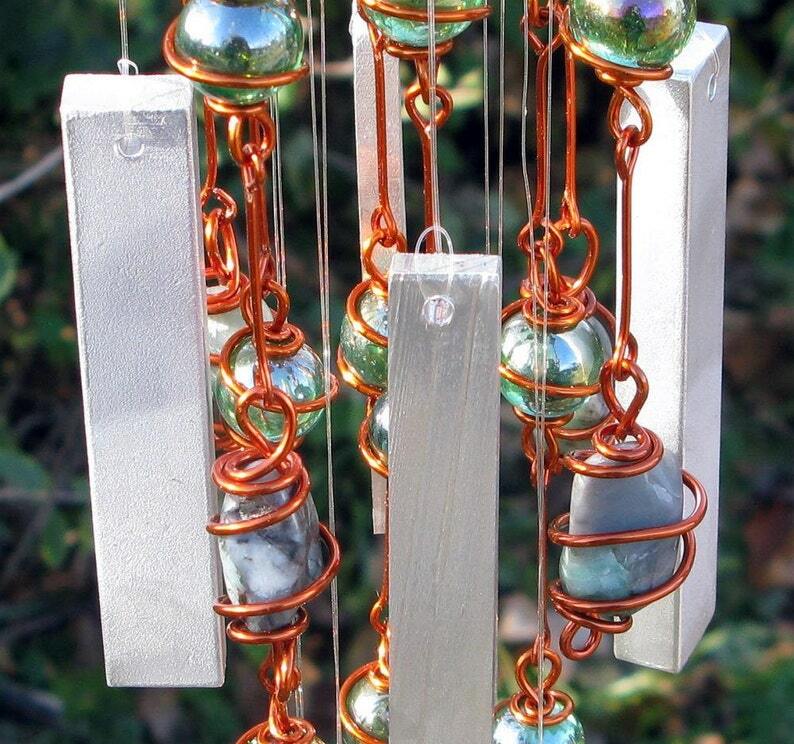 This unique windchime features 72 iridescent emerald green glass marbles, individually hand-wrapped in solid copper wire with an enamel finish (to retard tarnish). It is accented with 8 nuggets of tumbled Emerald, the traditional birthstone for May. The 8 aluminum chimes are pieces of industrial scrap. They are the discarded ends left when a manufacturer cuts flat stock to length. I clean them and drill a hole but, other than being spiffed up a bit, they are exactly as they came off the line. These little cast-offs make a gentle sound (think raindrops, not monsoon) so they won't disturb the neighbors! Emerald is the precious green variety of the mineral beryl and ranges from milky green to the transparent rich green of the jewelry grade gem. Metaphysically, Emerald is said to be a stone of protection, love and romance that brings both passion and domestic bliss. It is believed to enhance harmony, memory and faith and to promote truthfulness and honesty. Every chime comes complete with a "cheat sheet" that summarizes it's metaphysical properties. Copper is the traditional gift for the seventh anniversary. As these are natural nuggets, the sizes and shapes of the Emerald pieces will vary from windchime to windchime. Overall width of this piece is 3.5" and the length is 27". To hear my windchimes, please visit my YouTube channel at http://www.youtube.com/user/TapestryArabianFarm. This chime is ready to ship and will be mailed Priority Mail within one business day of payment. Beautiful!!! I love these so much and everyone that sees it, wants one! Every morning I move it into the sunlight as it hits our breakfast table. Breathtaking!! Love it thank you!! Very exciting piece of art. Wonderful size and the quality is amazing. I will be back for more things in the future. Amazing piece of art. I have bought here before and really appreciate the talent that is evident in each item. You will not be disappointed if you buy something here.